Did you know that FamilySearch.org now uses two different camera icons to indicate if a digital record image is available for a particular record? You can see the two different images in the screenshot below, showing a list of some Historical Records collections available on FamilySearch.org. So what do the differences in these icons mean? The camera icon with the box around it indicates that the digital record images available are on a FamilySearch partner site (such as Ancestry.com or Fold3.com). The camera icon by itself (no box) indicates that the digital record images for that collection are available directly on FamilySearch.org. These icons are helpful, so that you know upfront before you search a collection if you’ll be able to actually view the images, particularly if you don’t have a subscription to one of the FamilySearch.org partner sites that requires a paid subscription. 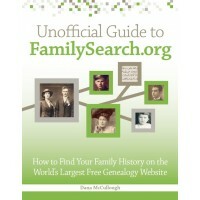 See more tips and strategies for using FamilySearch.org in my book, Unofficial Guide to FamilySearch.org, published by F+W Media. Order your copy now!